To put the achievement of Ishiro Honda’s original 1954 Godzilla in perspective, one must consider the horrors from which it was born. The atomic bombings of Hiroshima and Nagasaki occurred only nine years prior to the film’s creation, and even with such a relatively small amount of historical hindsight, Honda and company were able to create a movie that tackled nuclear devastation head on, summoning the myriad mournful and terrified emotions of one of the most destructive events in human history and channeling them into a profound and visceral work of commercial art. How could such a coherent and impactful response to the bombings come so soon after the attacks, and in the confines of a major studio release, no less? It would be like a Hollywood studio releasing a tentpole feature that directly confronted 9/11 – and was a legitimately great film, rather than a dull and manipulative throwaway – by the year 2010 (needless to say, such a film has not yet been made). Godzilla may have launched an enduring and iconic franchise known and beloved for campy, guiltless fun, but the original remains a dark and thought-provoking masterwork, a film that is both a major technical achievement and an evocative wellspring of atmosphere and ideas, one which never fails to haunt me for hours or days after seeing it. Now, American audiences have been given a rare chance to experience the film theatrically, as Rialto Pictures has begun rolling out a limited theatrical re-release throughout the United States, just in time for the release of Gareth Edwards’ new Godzilla feature. Needless to say, it is an opportunity everybody should take advantage of, for this is a great and enduring classic, one that has aged extraordinarily well and lost none of its power in the last sixty years. The prospect of a new Godzilla film inspired by the tone and concepts of the original is extremely tantalizing, and I greatly look forward to seeing what Edwards has crafted next week, but Honda’s film remains vibrant and irreplaceable, and now is the perfect time to celebrate it. Perhaps the most striking element of Honda’s film is that, as often as it is described as such, Godzilla is not an allegory. The film tackles the devastation of nuclear war directly, not only claiming the H-bomb as Godzilla’s origin, but referencing the Hiroshima and Nagasaki bombings on multiple occasions. Characters never sit down and overtly discuss their reactions to the horror of nuclear holocaust, but everybody in the film is marked by it, the terror of living through such fear and desolation once more defining every person’s actions. The ensemble nature of the film is crucial, for like the Italian Neorealist films that emerged after that country’s wartime strife, individual characters matter less than the whole, a variety of figures and voices playing a part in the drama. 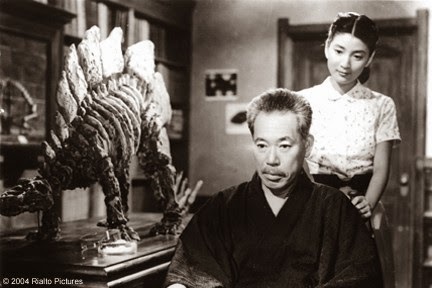 And while Godzilla may lack the polished, powerful characterizations of a Rossellini film, the performances are quite good – as the paleontologist who uncovers Godzilla’s origin, Kurosawa regular Takashi Shimura in particular lends the film a crucial level of gravitas – and the ensemble quality is critical in understanding the communal trauma the film explores. 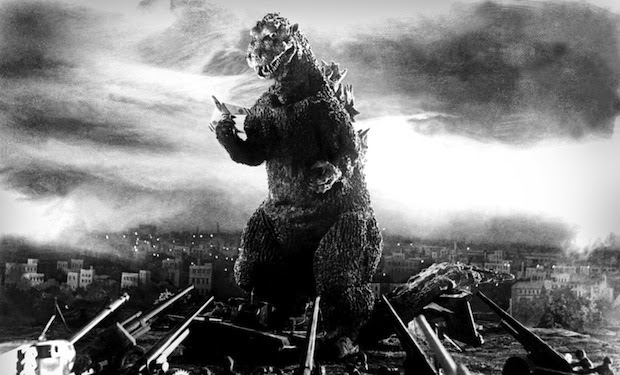 The fear, the grief, the guilt, the anger, the indignation of nuclear warfare and human-induced suffering – it’s all there, barely sublimated, simmering just beneath the surface, and Godzilla himself does not so much act as a metaphor to these emotions as he does a recurrence of them, his emergence triggering a relapse of wartime panic and anguish. It is no surprise the film was controversial in Japan upon release, for probing and dramatizing such painful memories could not have been comfortable. But the brilliance of Godzilla is the ease and elegance with which it eases viewers into the horror. The film is, for its first half at least, extremely slow and methodical, almost entirely detached from the emotions of the action as Godzilla’s activities and origins are investigated and possible courses of defense discussed. 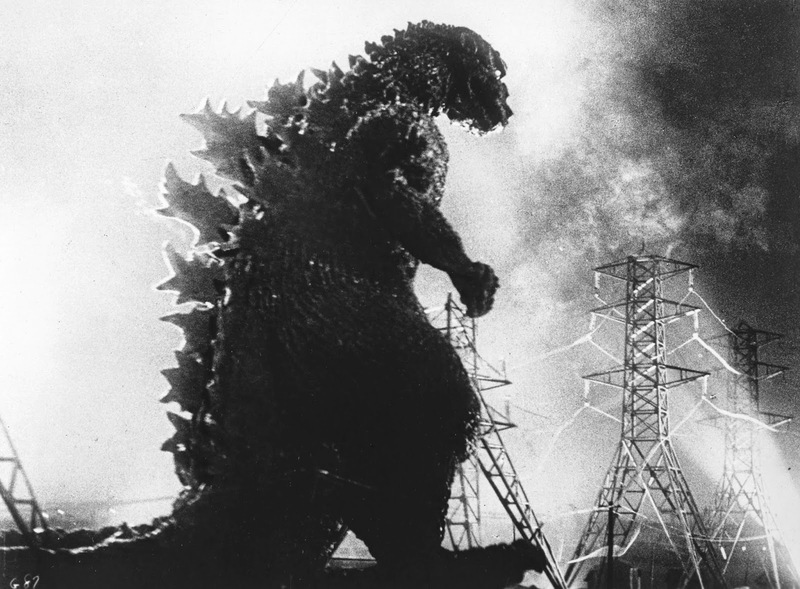 The drama is well-staged and engaging, but even up through Godzilla’s initial appearances – first on a remote island, seen only from the neck up, then stomping through a city, glimpsed only fleetingly with the destruction kept to a minimum – the audience is kept at arm’s length, just as the film’s characters seem to be repressing or shying away from the horror of what might come to pass if Godzilla is not stopped. For a time, the film is quiet and clinical, but as the threat rises, the ‘reality’ of it gradually becoming more and more palpable with each passing second, the viewer’s level of tension increases exponentially. The effect is almost entirely subliminal. Yet by the time Godzilla emerges to challenge Japan’s new defenses – barbed, electrocuted fences built 100 feet high – the tension is almost ready to snap, for both the characters and the viewer, and snap it does in one of the most effectively atmospheric and horrifying depictions of widespread chaos and destruction ever committed to celluloid. Godzilla’s rampage through Tokyo, the centerpiece of the film, is positively mesmerizing. Make fun of the cheesy ‘man-in-a-rubber-suit’ effects all you want in latter Godzilla films – here, the technique is flawless, due not only to the undeniable effectiveness of the creature’s visual design, but to Honda’s chilling, stark, and positively nightmarish black-and-white photography. I would argue a movie monster has never looked scarier, for every image in Godzilla’s rampage is a powerful one, and the pace and construction of the sequence is inspired on every level, starting with large-scale annihilation and building increasingly destructive from there, all while maintaining a slow, staccato rhythm, in keeping with Godzilla’s stiff and labored movements. Many of the best movie effects come from working within limitations, and here, Honda absolutely used the confines of what the Godzilla suit could do to his advantage. The monster is scarier because is he slow and clunky, because no matter how sluggishly he progresses, there is still nothing mankind can do against him. By the time the sequence ends, we have been treated to several false climaxes, pushed past whatever preconceived notions we had of destruction’s limits over and over again, and so we are left in the same horrified, traumatized state as the characters, everybody desperate to find a solution to an unsolvable problem. The difference between the viewer and the characters at this point – one important to note for contemporary American audiences, who can hardly fathom something like Hiroshima or Nagasaki – is that for us, this trauma is fresh, while for the ensemble, it is like reopening a wound and pouring salt on it. 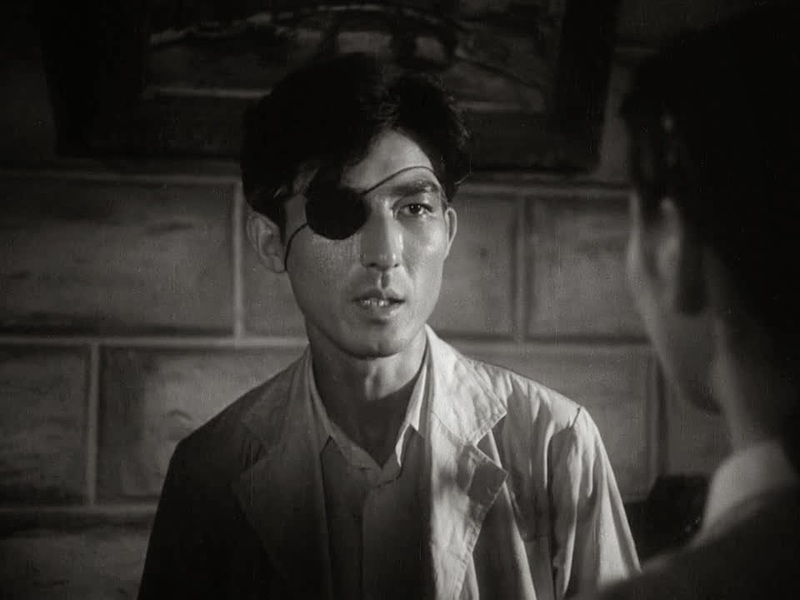 The desperation and sorrow that emerges in the film’s final act is so heavily palpable because the film claims to exist in the same reality as that of the atomic bomb. Given how powerless the victims of nuclear attack were the first time around, what hope could be had if such desolation returned, more overpowering than ever before? What recourse would exist? What would our options tell us about the human condition, and would our choices alleviate the horror of the scenario, or only compound the grief and guilt at play? In asking these questions, through the arc of conflicted scientist Serizawa (whose “Oxygen Destroyer” machine, while scientifically absurd, works as a powerful concept within the themes of the film), Godzilla becomes so much more than a mere response to the bombings. It is also a sad, resigned vision of the future, a vision in which humanity’s need to destroy, to push at the most extreme corners of science and use what we find for violence, sets nature back upon us in a grim, grisly recurrence of Japan’s wartime fate. And even as the Oxygen Destroyer succeeds in killing Godzilla, the deployment of another weapon of mass destruction leaves us with little to no hope in the end. The film concludes with the Professor warning us of doom if we continue making, testing, and deploying such terrifying weapons, but the message is destined to fall on deaf ears. Sixty years of hindsight and evidence, of other terrible war machines coming into existence and deployment, would be unnecessary to feel the weight of his warning. Even in the moment, given the tone of the scene and the overwhelmingly somber atmosphere, the sense of endless recurrence is palpable. If Godzilla is an allegory for anything, it isn’t the bomb, but for humanity’s cruelty and arrogance, marching perpetually ahead without opportunity for recourse, stomping and raging in endlessly destructive outbursts. Against such an enemy, there can be no victory, and so it goes for the film. While the monster is destroyed, there is no sense of triumph, nor any absolution or hope. The film is, ultimately, grim and defeatist, an elegy to the circular nature of destruction. The pessimism is, undoubtedly, earned. For these reasons, Godzilla endures, far removed from the time, place, and context in which it was created. Honda and company took Japan’s national trauma and turned it into something both shockingly relevant and eternally universal, for the issues explored here have yet to be resolved. Until humanity’s obsession with weaponry and egocentric relationship with the environment is ended, Godzilla will always be an important and provocative work. One wishes for the day when it really will feel dated, when these issues can be relegated to the annals of history, but until that day comes, if it ever does, Godzilla is a film we deserve, a film we should experience, study, discuss, and revere. Few movies, monster-themed or no, leave such an impact. Godzilla: The Japanese Original is now playing at the Sie Film Center in Denver, and at various other locations throughout the country. Visit Rialto Films for bookings and dates.